The Inbetweeners car on ebay: Could this be the UK's most expensive Fiat Cinquecento? 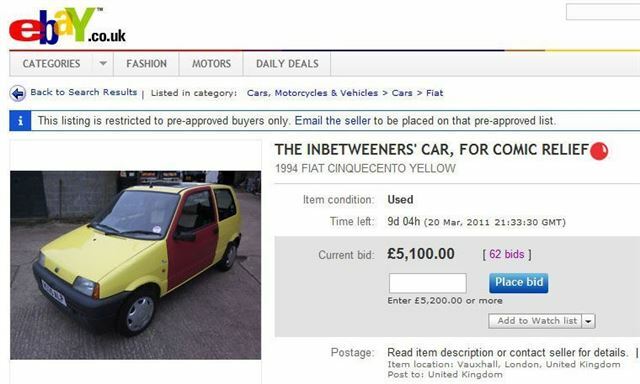 The car that starred in Channel 4's comedy series The Inbetweeners is being sold on ebay for Comic Relief. The 900cc yellow Fiat Cinquecento (with a red passenger-side door) starred alongside the boys in all three series of the show and was most most recently featured in a 'Rude Road Trip' - a one off for Comic Relief. Bidding has started at £50 and had reached £5100 by Friday evening. Ordinarily, it would be worth somewhere in the region of £250-£400. Anyone thinkning of bidding should be aware that the MoT runs out in April and it only has tax until June 2011. It has had three (non-fictional) owners and has racked-up 76,235 miles. "This is the genuine article! Not only the actual car featured in the the hit TV show, but it's the vehicle responsible for getting the four boys to some of the rudest place names in the UK. SO BID NOW!!! You'll impress your friends with this unique motor , Comic Relief will spend ALL the money you bid on life-changing projects, and the sun will shine. (That last bit about the sun might not be true). This item is only available for collection only, from a site inHemel Hempstead. Comic Relief will contact the winning bidder within 10 days of receiving payment to arrange collection."